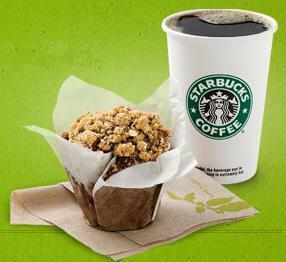 Starbucks® is with us today to review engagement and personalization in social media marketing. Oops… there’s a technical difficulty: Your blogger/host has already consumed the product. Instead, please bring your own Starbucks brand experience to the table. Indeed, you may already have a hearty share of mind about Real Food, Simply Delicious, the new social media campaign recently launched by Starbucks. Like me, you may have stepped into a Starbucks before or after a meeting. It’s second nature to buy a beverage and add a carbolicious snack. New low-fat options definitely decrease resistance. Starbucks sends me a note with a p.s.! This Starbucks package is teaching me personalization in social media marketing. Wow. Genius. 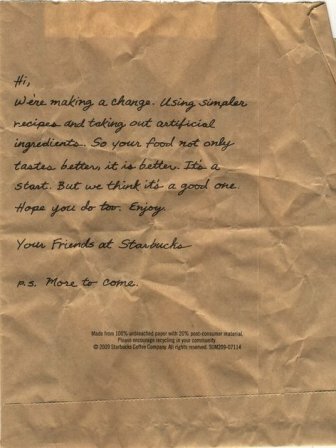 Starbucks placed direct mail’s most trusted response generator at a unique touchpoint — when the purchase product is in use. Here I was, reveling in my self-created, one-to-one Starbucks experience. I had just finished the delicious food snack. Seamlessly, this one, small, timely p.s. steps in to reinforce my choices, experience and, so, my loyalty. It signaled that the actions I had chosen to take were good ones and worth acknowledging. Rather than directing the experience and my actions, the message enhances response. In this way, it generates fresh interest and robust commitment to new, undetermined activities. No letter, no mass customization. No push. The p.s. pointedly states “More to come” and I’m ready. Why am I so future shocked? Adding a p.s. to a personalized letter boosts response significantly the experts tell us, backed by DMA statistics. Some use it restate the offer or call to action, while other marketers mention special incentives or a deadline. The p.s. is one of the most read sections of a direct mail package, along with the teaser and the order form. Here is this direct mail p.s. No longer a technique, it’s strategically set in a new context to make the p.s. relevant, exciting, and engaging. It’s not even on the front, where you might expect. Instead, this warm afterthought pops up on the back of the bag. As I did, you might happen to find it when you’re done and ready to go. Does Starbucks have something social going on? Wikinomics will have to wait! I’m already hacking the social media track. 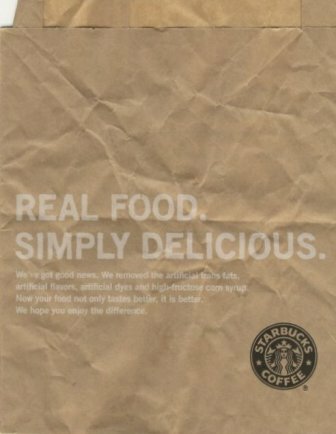 I flip the bag over and sure enough: there’s a classic awareness print ad placed on front. More to come in the next post. Social media offers a new definition of personalization that many multichannel interactive marketers are scrambling to understand, or trying to reproach and dismiss. Personalization in social media serves as a magnet of individual and community experiences. Consumers generate their own robust, committed response at a later stage of the classic pipeline. P.S. More to come of this social media trail!